Save a game - The current game can be saved so that it will be possible to open and resume it at any later time. Print a game - The play area of the current game can be printed. Preset puzzles - ChromaticPuzzle comes with 20 preset puzzles, featuring stunning artwork and photography. 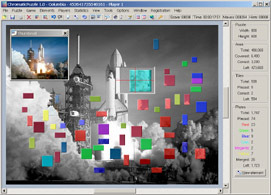 Create a puzzle - A puzzle can be created by importing any image in any of the supported file formats (.bmp, .gif or .jpg). The width and the height of the new puzzle, as well as the average number of tiles, can be freely chosen. ChromaticPuzzle automatically makes all the necessary calculations to ensure playability. Select a game - To each game is unambiguously related a game number, and vice versa. Each game number identifies a specific shuffle and thus uniquely determines the shape and size of all tiles as well as the initial color and order of all plates. ChromaticPuzzle can generate a million billion different shuffles for each puzzle, numbered from 1 to 999,999,999,999,999. Any of these game numbers can be selected. Hint move - ChromaticPuzzle can suggest a move by highlighting two mergeable plates in the play area. Element handling - All tiles and plates in the play area can be flushed left, right, top or bottom. They can also be sorted horizontally, sorted vertically or removed from the play area. Players - Players can be added, edited or deleted. This allows games of any puzzle to be played in a competitive way. Statistics - ChromaticPuzzle uses statistical analysis in many different ways and can show statistics relating to played games (game statistics) and to players (player statistics). In addition, it keeps track of all played games (games log) and of highest scores (highest scores). Game statistics and player statistics feature attractive graphs. Grayscale puzzle background - For reference, a grayscale copy of the puzzle can be used as background for the play area. 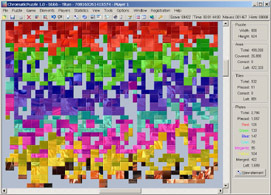 Thumbnail - For reference, likewise, a color copy of the puzzle can be kept in view in a small window. This window can be moved anywhere on the screen. Check elements - ChromaticPuzzle can check and show the elements correctly or incorrectly positioned in the play area. Magnifying glass - Any portion of the play area can be temporarily enlarged by a factor of 2, 4 or 8. 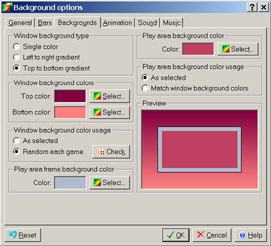 Options - ChromaticPuzzle can be thoroughly personalized by means of a wide range of options, covering topics such as general features, bars, backgrounds, animation, sound and music. Music support - ChromaticPuzzle fully supports MIDI songs as background music, and features a play list that can be totally customized. A few songs are also included as examples. Selectable windows - The play area is made up of two identical windows, in order to provide more space for tiles and plates. 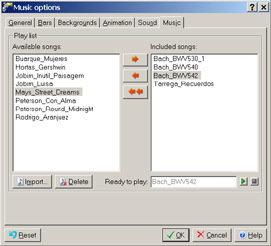 A game can be played simultaneously in both windows, switching from one to the other and moving elements back and forth at will.